Tired Hands HopHands Clone -- Brew Day ~ Spotted Dog Brewing Co. I recently was fortunate enough to spend a Sunday afternoon at the newish Tired Hands Brewing Company brewpub located just a short drive away from Philly in Ardmore, PA. The brewpub, run by Jean Broillet and his wife Julie, has been getting some very positive press since it opened for its quality hop-forward beers and constantly changing tap list full of small-batch, well-crafted brews. Of their two regulars, HopHands and SaisonHands, I dramatically preferred HopHands. The brew seemed just perfect for a summer quencher. 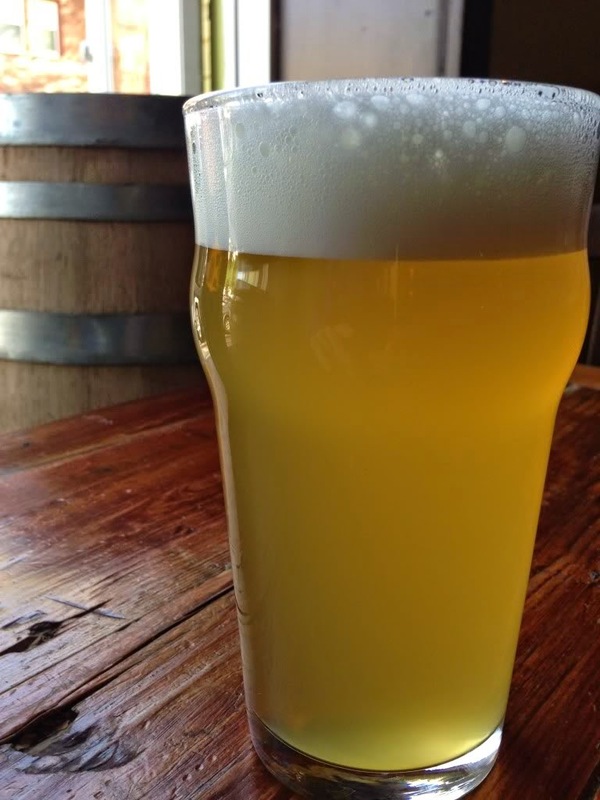 HopHands is a 4.8% ABV American Pale Ale described by Tired Hands as "brewed with oats and hopped with a blend of Simcoe, Amarillo, and Centennial. Not os lush citrus, fresh cut grass, under-ripe kiwi, and slight pineapple". I'm not a big kiwi aficionado, but I'm very impressed by that description. A fellow Philly home brewer did a ton of legwork already trying to clone this beer, so I'm merely adjusting his recipe for what he said he would change for the next go around. My mash pH came in a little high at around 5.6, so I added a bit more lactic to the mash to drop it to around 5.45. It seems my chemistry spreadsheet is off a bit, the past few batches I've had to add some more lactic to the mash. Mash @ 150f for 60 minutes. 5/3/2014 -- Brewed by myself. Mash pH came in a bit high so added 1ml of lactic to drop it to 5.45. Efficiency came in low again at 68%. Maybe I'll just throw in the towel and assume this is my new baseline efficiency. Gathered 5.25gal of 1.046 wort. 5/18/2014 -- Dry hops added. 5/22/2014 -- Bottled. 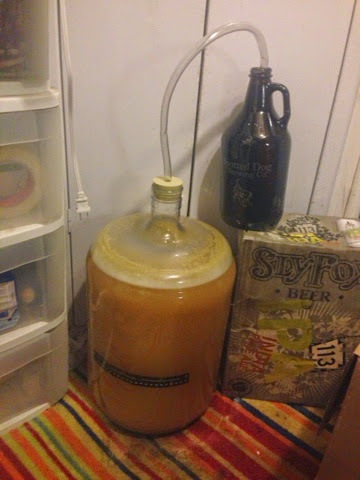 Final gravity was 1.010. Right on target. Got two cases of bottles, added 4.1oz of corn sugar to prime at 2.4vol. 7/6/2014 -- Tasting notes. Came out pretty nice. Looks great! How did it turn out? Hey Ed, it's pretty solid. I lowered the oats and mashed cooler than you had and I think it came out a touch thin. It's got a solid taste, but from my tasting of the original I remember it being on the "grassier" side of APAs, and I think a bit more body/texture would balance out that grassy taste a bit. I'm going to steal this for my next APA, maybe up the oats a little and add a touch of honey malt with a mix of nelson/galaxy hops. I really love what the Oats can bring to these hoppy beers, I went a little lower on my second batch but it lost a little something. Cheers Josh! I think I'm def upping to oats and mash temp next time. I may also play around with some of the hops to add a little bit more of an assertive bitterness. Really was a nice summer beer though. Thanks for doing all of the legwork. If I have any left I'll try to bring them to the club.